How to explain to you all, that what I saw in Him was what I saw in the Upanishads and in the Bhagavad Gita. The work of spreading the Gita and the Upanishads was to unveil Him and His glory, His vibhuti - 'Tapovan Mahima', in the hearts of all. He is history’s few, God’s own ascetic, a beacon of knowledge, and a Himalayan jewel — all rolled into one. Swami Tapovanam is a symbol of complete abidance in Truth, the light that never descended — philosophically, literally, and figuratively. He was that pristine glacier of Self-knowledge from whom flowed the Ganga of Vedantic wisdom through Swami Chinmayananda, the founder of Chinmaya Mission. A saint of the highest order, Swami Tapovanam was a consummate Vedantin, strict teacher, a compassionate mentor, a poet whose every thought throbbed with ecstatic awareness, and a sage of unsurpassed wisdom and tranquillity. He is one of those rare sages who personifies the Absolute in every sense of the word — eternal and infinite — radiant and resplendent, dazzling with the effulgence of a million suns. 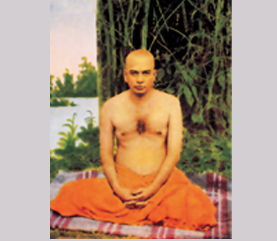 Swami Sivananda called him ‘Himavat Vibhuti,’ meaning “the glory of the Himalayas”; and in the world of sages and ascetics, he is acknowledged as one of the four great enlightened masters of Vedanta who lived in the Himalayas during the time, along with Swami Vishnudevananda, Brahmaprakasa Udasina, and Devagiri Swami. God is Truth; Beauty is truth. He who believes in God and is devoted to Him, even if he commits sins, will gradually attain devoutness and Liberation. It is the ardent faith in one’s own Self, God, religion, liberation and in the word of the sages that is at the root of all virtues. The existence of God is not to be proved by logic or reasoning, but it is to be accepted by faith resulting from previous samskaras. For people who are firmly convinced that everything is God and who find joy in Him, what is there to fear, where is fear to be found? The Divine Principle manifests itself to him who firmly believes in such existence (of Truth). To him who hugs the idea of non-existence of God, how can the principle manifest itself? In the effort to realize the Supreme Truth, it is not the science which can help you most–it is only faith that can stand you in good stead. It is from the ego that the world tree springs up–with Knowledge one should cut off and might of the ego. When the mind gets detached from all worldly trammels, it becomes easy for that mind to gain the Divine experience, thereby enjoying the highest state of bliss. Dharma is not for the pleasure of the doer, nor is the doer for the pleasure of Dharma. The first thing that true seeker of happiness has to do is to conquer desire. Desire is the seed of all fear and sorrow. The root of ‘samsara’ is desire. When we are born, death is born with us. Alas! Think how customs get the better of man and enslave him! Even the intelligent man ought to know that customs are made for man, not man for customs. Everything has its own place in the economy of the Universe! Love of God is untouched by sorrow; it is eternal, of the nature of bliss and so, to the seekers of liberation, it is most desirable. Wonderful indeed is the perversity of illusion! In the world the wicked ones are created as a touchstone to the good. Attachment and aversion are not altogether different. When attachment is frustrated, it turn to aversion. It is in vain to waste one’s time considering which God to worship. Worship him in any form. It is the sincerity of devotion that matters. Give up pride and egotism and devoutly immerse yourself in the thought of God. Love without faith and sincerity is naught.